Most people seem comfortable with using hi-tech credit cards instead of current ones that rely on signatures. Three-quarters of UK consumers said using cards with a special chip in them would make paying by plastic safer, a survey by Mastercard has found. The so-called Chip and Pin cards are being tested in Northampton and could be in widespread use by next summer. The system is designed to fight credit card fraud and relies on a four-digit code number instead of a signature. Around a thousand people were interviewed for the survey for credit card company Mastercard. A majority - 75% - welcomed the idea of tapping in a Pin instead of signing a slip of paper, believing it would make paying by credit card safer. About half thought it would be quite easy for fraudsters to copy their signature, while just under 10% admitted they knew someone who had signed for goods using someone else's card. "It's clear that the nation lacks complete confidence in the security of signature only checks," said Paul Lucraft of Mastercard. "We are very aware of their concern, and by replacing signatures with Pin numbers at the point of sale we will go a long way towards making plastic safer for everybody." The trials in Northampton are due to come to an end next month, when the banks and retailers involved in the Chip and Pin scheme will decide whether to introduce the new hi-tech card across the UK. Mastercard, one of the credit card companies backing the Chip and Pin technology, says the pilot has gone well. 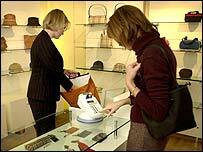 It expects the new technology to appear on the High Street within the next 12 months. "We are aiming to have more than 60% of card transactions using Chip and Pin by the middle to the end of next year," said Mr Lucraft, who is Mastercard's general manager of business services for Northern Europe. The new cards have a thumbnail-size microchip that stores personal data more securely than the magnetic stripe, making it harder to counterfeit. The UK banking industry is hoping the system, which has been commonplace in several European countries for a number of years, will reduce credit card fraud which cost them an estimated £420m last year. 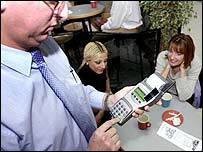 It is expected 850,000 retailer terminals, 120 million cards and 40,000 cash machines will be upgraded by 2005.